The NGO C4ADS reports that the trade of totoaba swim bladders to feed Asian markets is as much a security issue as a conservation problem. 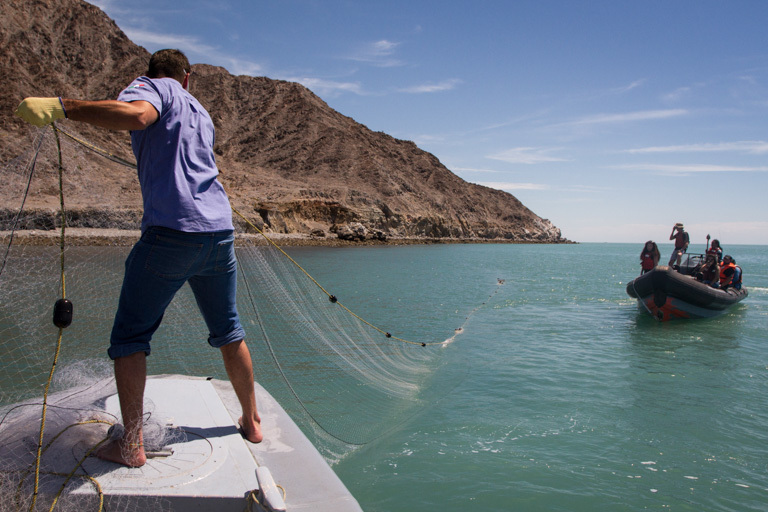 Fishermen and women in the Gulf of California have continued to pursue the critically endangered fish, despite the ban on gillnets, which have also decimated the vaquita porpoise. Vaquita in the wild number fewer than 30 animals, scientists say. C4ADS has published the results of its investigation with evidence of the overlap between totoaba traders and drug traffickers on a new website, and will published their recent report in Spanish. When Samuel “El Sammy” Gallardo Castro was shot and killed on a Mexican beach in 2014, it could have been just another gangland killing of a drug dealer from the notorious Sinaloa cartel. However, local reports point to a struggle over the trade of swim bladders from the totoaba (Totoaba macdonaldi), a critically endangered fish that lives in the Gulf of California. Also known as maws, these organs are in high demand in China and Hong Kong for their supposed medicinal properties. One person confessed to the murder, saying that Gallardo owed him more than $1 million from a totoaba load. Other evidence indicated that another narcotics trafficker wanted to supplant Gallardo and assert control of the trade for himself. Gallardo’s demise is one of the case studies chronicled in a recent report by the NGO C4ADS based in Washington, D.C. Mary Utermohlen, a program manager with C4ADS, said it’s easy to see how a shift from drugs to totoaba swim bladders might be enticing. 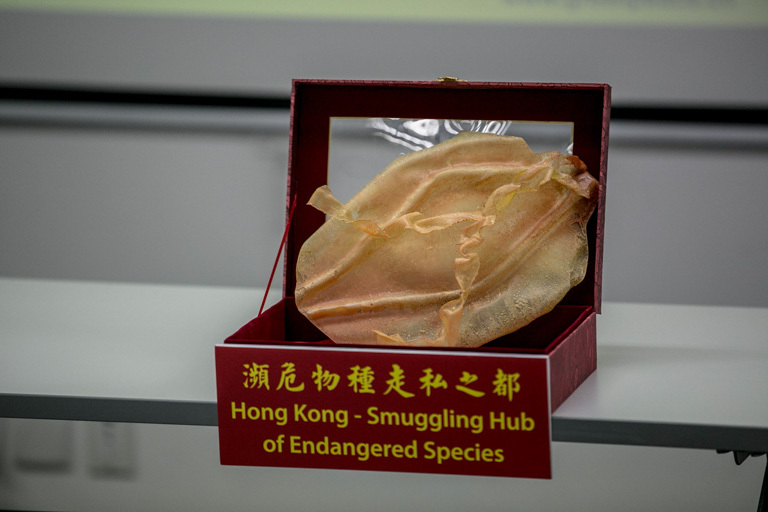 The maw of totoaba on display during a press conference held by Greenpeace East Asia. Photo and caption © Greenpeace / Sudhanshu Malhotra. The trade in totoaba maw is decimating not only the totoaba, which hadn’t fully recovered from overfishing that peaked in the 1970s by the time fishermen began to target totoaba for their maws in earnest in the early 2010s. The gillnets used to catch totoaba also snag and drown tiny porpoises called vaquita (Phocoena sinus) with ruthless efficiency. Scientists estimate that fewer than 30 survive in the wild. The Mexican government has spent millions of dollars to rid the northern Sea of Cortez of gillnets, crack down on the use of now-illegal gillnets and protect the vaquita. Currently, a team of marine mammal experts is attempting to capture vaquita to house them in sea pens until they’ve neutralized the threat. Investigations by other NGOs have centered on the “destination” side of the trade, Utermohlen said — that is, the shops and markets in Asia that cater to maw-hunting consumers willing to fork over eye-popping sums. One recent report found that a kilogram of totoaba maw could fetch $20,000 in China (about $9,100 per pound). What C4ADS set out to do was look at the problem more “holistically” by including data and information detailing the trade and its destabilizing effects on local fishing communities, Utermohlen said. They’ve also set up a website for the data and other information that they’ve collected, giving other organizations the chance to spot trends that C4ADS may have missed, and are scheduled to release the report in Spanish on Nov. 8. Greenpeace activists investigate the habitat of the endangered vaquita in the upper Gulf of California and locate illegal gillnets, which are contributing to the rapidly declining numbers of vaquita. Photo and caption © Carlos Aguilera / Greenpeace. Their conclusion is that the trafficking of maws is a security problem, not just a conservation one. Initially, Utermohlen said, they didn’t know how much totoaba traders would intersect with the likes of organized crime syndicates in Mexico. But as the team dived into the research, more connections like the one with Samuel Gallardo began to surface. The temptation for drug dealers is clear, even if hard evidence of continuing overlap is more difficult to track down. The value of a16.5-kilogram (36.4-pound) haul of totoaba dried maw seized in 2013 from a trafficker based in Calexico, Mexico, was worth an estimated $361,500, according to the report. That same amount of money would buy 29 kilograms (64 pounds) of cocaine, or more than 4.5 metric tons (nearly 5 tons) of marijuana. A fisherman or woman’s cut can be life-changing, according to C4ADS. Interviews by Greenpeace in 2015 revealed that fishermen and women said they could make $8,000 per kilogram of totoaba bladder. And corrupting officials is an easier task. While everyone is looking out for evidence of drug smuggling, particularly at places like the Mexican border with the U.S., there’s a chance that inspectors might assume a heap of totoaba maw is just legal fish product. So far, penalties seem to be less likely, or at least less severe, than for narcotics, Utermohlen said. 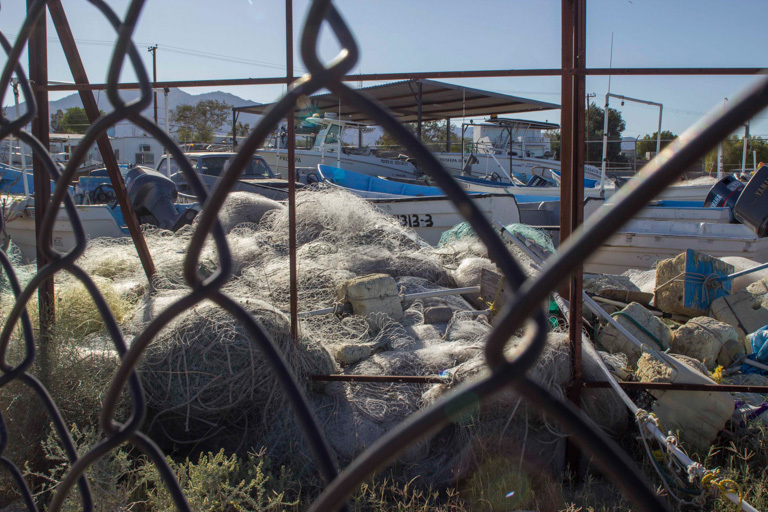 Gillnets and boats confiscated by the Mexican Federal Bureau of Environmental Protection in San Felipe, Baja California. Photo and caption © Lein de León Yong / Greenpeace. That’s one area where Utermohlen and her colleagues advocate increased pressure on the traffickers through enforcement. “What we’d really like to see is, if a panga is discovered with totoaba or totoaba gillnets, that a real investigation follows that up,” she said. But whether that happens remains to be seen. The Elephant Action League (EAL), an NGO that investigates wildlife crimes and recently produced its own report on the totoaba trade, said in a statement on Wednesday that fishermen may once again be able to get permits from the Mexican government to harvest totoaba starting in February. “The totoaba trade must remain illegal in both Mexico and China, and alternative fishing gears must be developed as soon as possible to assist the fisherman with legal fishing and prevent protected species from being caught like the vaquita and other sea life who continue to die trapped in gill nets,” the EAL wrote in the statement. Banner image of Greenpeace activists locating illegal gillnets © Carlos Aguilera / Greenpeace.